Happy Monday everyone! Hope you had a relaxing weekend. Today I have a set of cards to share. This set is a bit out of the box for me because of the pastel and monochromatic colours. Here is the photos of all the five cards. 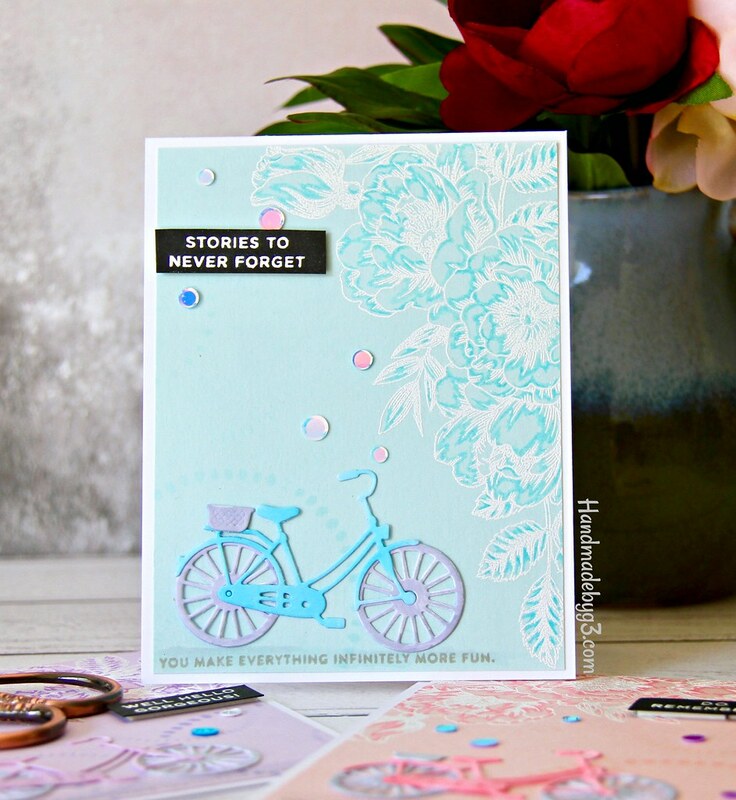 I used Simon Says Stamp’s Beautiful Flowers stamp set, Tabbed Sentiments, Vacations Time stamp sets, Classic Bicycle die and Jazz Dance stencil on these cards. I started by picked five pastel coloured cardstocks. Then trimmed them to 4×5.25 inches in size. I stamped the flower cluster image from Beautiful Flowers stamp set in versamark and white heat embossed the image on all the five panels. I chose a darker colour shade from Polychromos pencil and shaded the insides of the embossed floral cluster. 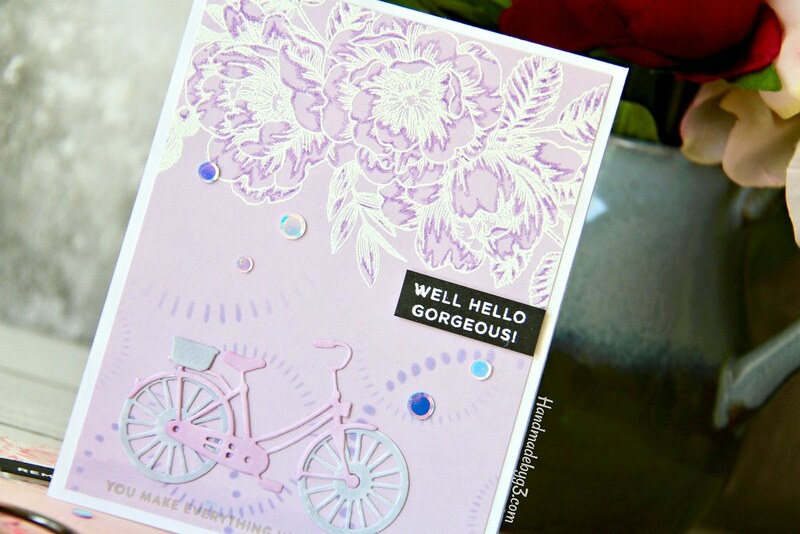 Then I used the Jazz Dance stencil and sponged a distress inks in Squeezed Lemonade, Shaded Lilac, Cracked Pistachio, Tumbled Glass and Spun Sugar over it on the bottom right corner or from the bottom in an ombre.This is very subtle and adds interest to the rather plain area. 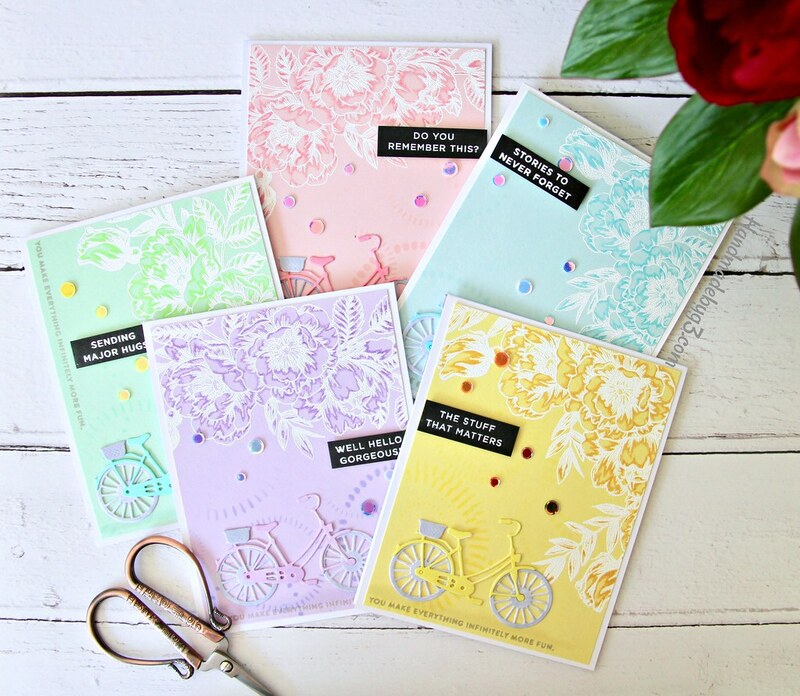 I die cut five bicycles out of white cardstock and coloured them using copic markers matching the cardstock colours. The tyres and the baskets are coloured using C2 cool gray maker. Then I assembled the bicycle and glued them down on the bottom of each of the panel. I added shading to the bottom of the bicycle to ground them. 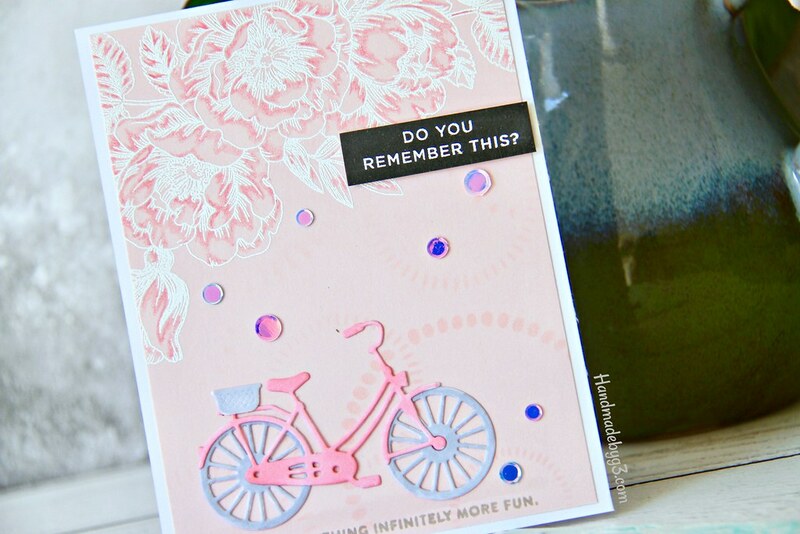 Using the sentiment “You make everything infinitely more fun” from Vacation Time stamp set, I stamped them either vertically or horizontally on all the panel using Simon’s Stone dye ink. Finally the sentiments from Tabbed Sentiment stamp set are white heat embossed on strips of black cardstock, trimmed and adhered using foam adhesives. The complete panel us glued to the white card base. Finally I used Simon’s Groovy Confetti to embellish the cards. Here are the photos of all the cards individually and closeup. I have used three different mediums on these card: Polychromos pencils, Copic Markers and Distress inks. 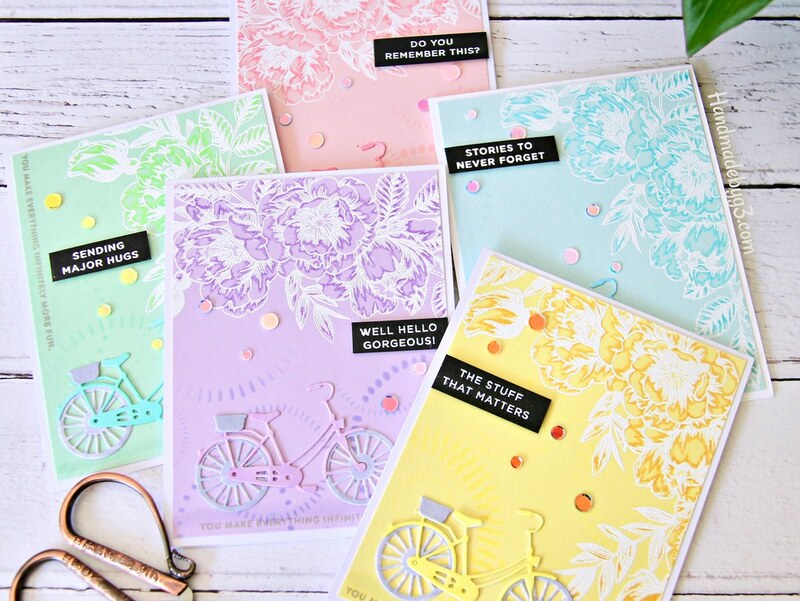 All of them in similar pastel shades to the cardstock. Then contrasted the colours using grey, white and back. 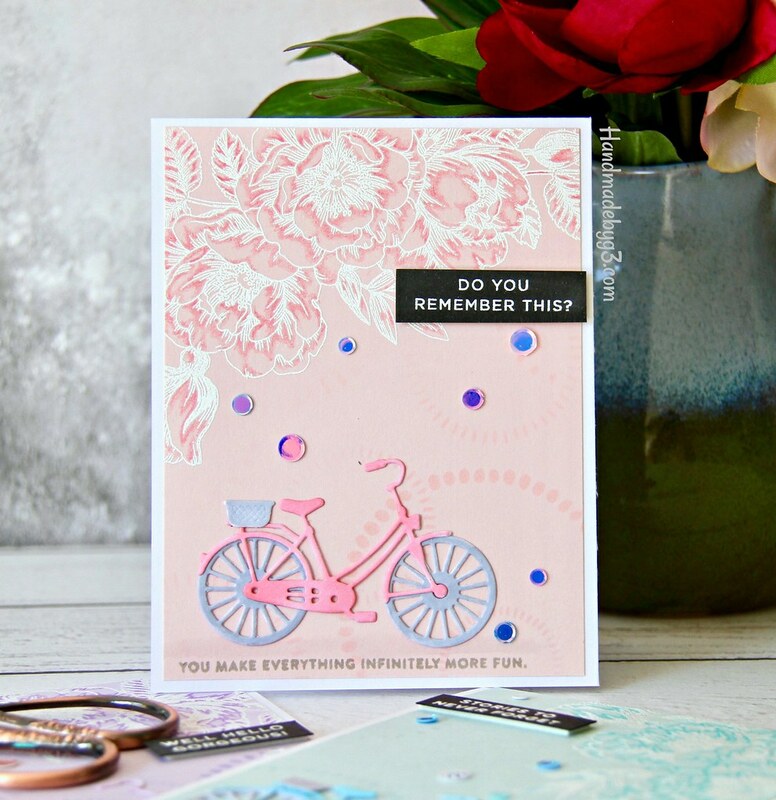 By rotating and stamped the floral cluster in different angles, each card is different yet similar since I used the same floral cluster image. Similarly the positioning of the sentiments also makes them different yet the similar. I really love to do card sets. 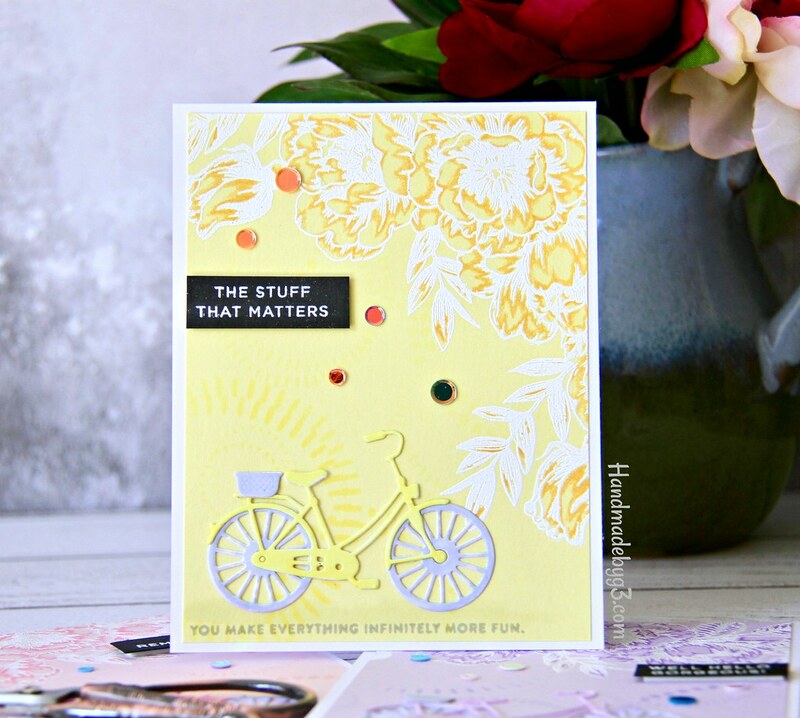 Since you already use the supplies to make one card, making simple changes and making a few more does not really take that much time. 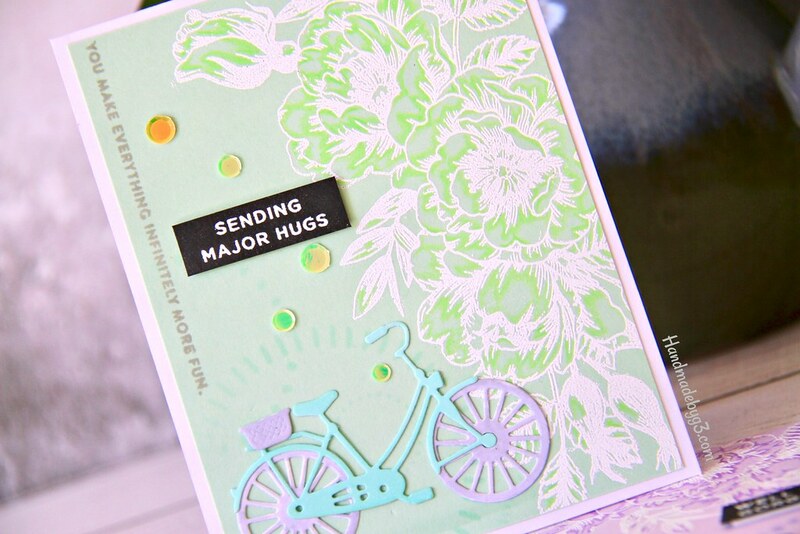 I have listed all the supplies used to make these cards below. Thank you so much visiting my blog today. See you tomorrow! I’ve never seen anyone do this coloring with embossing then color pencil for shading – it is really beautiful. 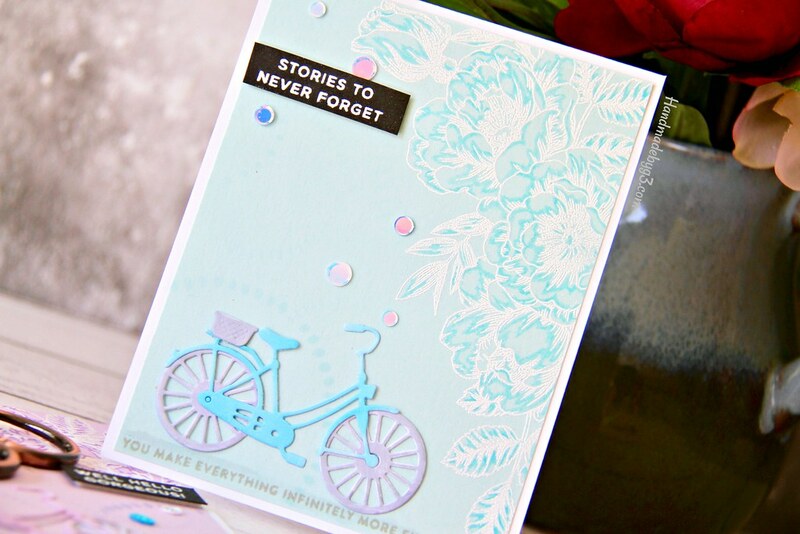 LOVE monochromatic cards and these are showstoppers. Love these! 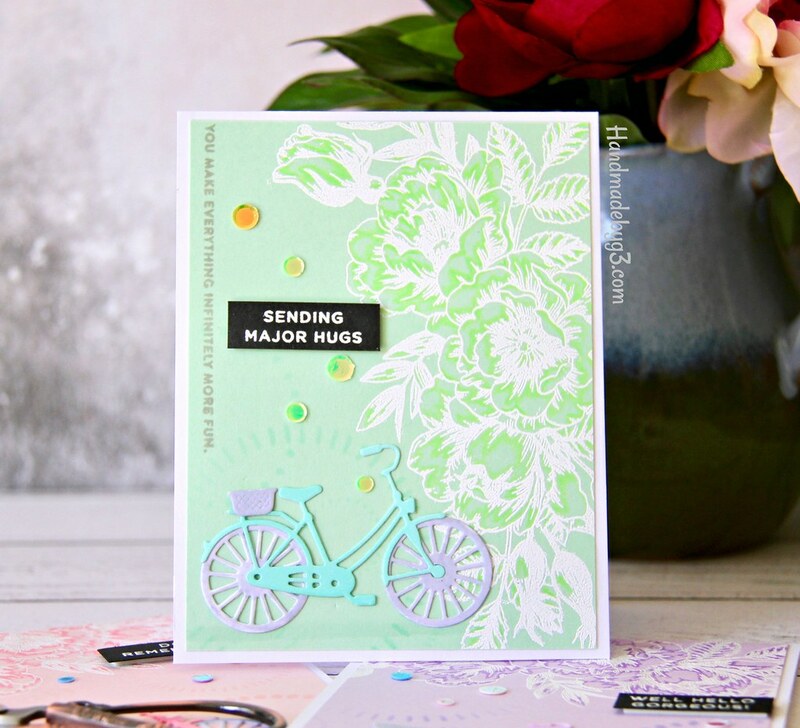 Beautiful cards and technique! I really love your style! Wow, these are gorgeous! I’ve never done any monochromatic projects but these definitely have me wanting to try. I really like the look of the Polychromos pencils, that is definitely my next major purchase. 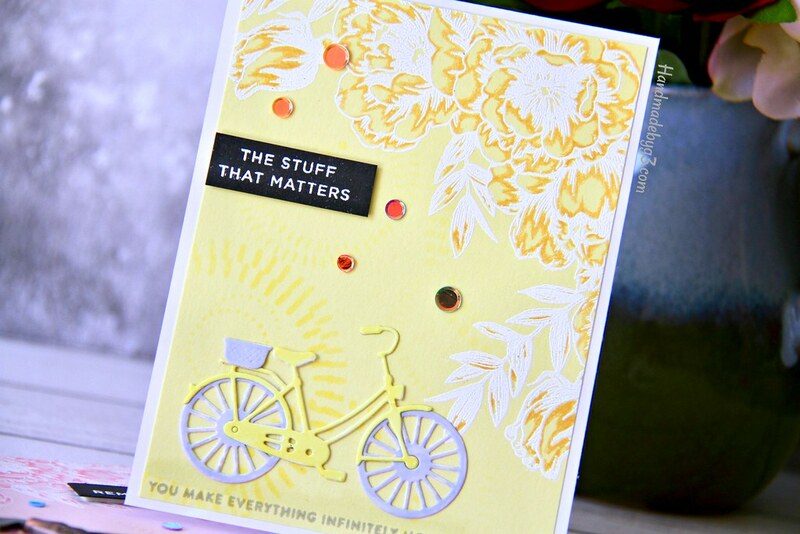 Thanks for sharing and for the inspiration to try a monochromatic card or two. These are all sooo pretty!! Love! 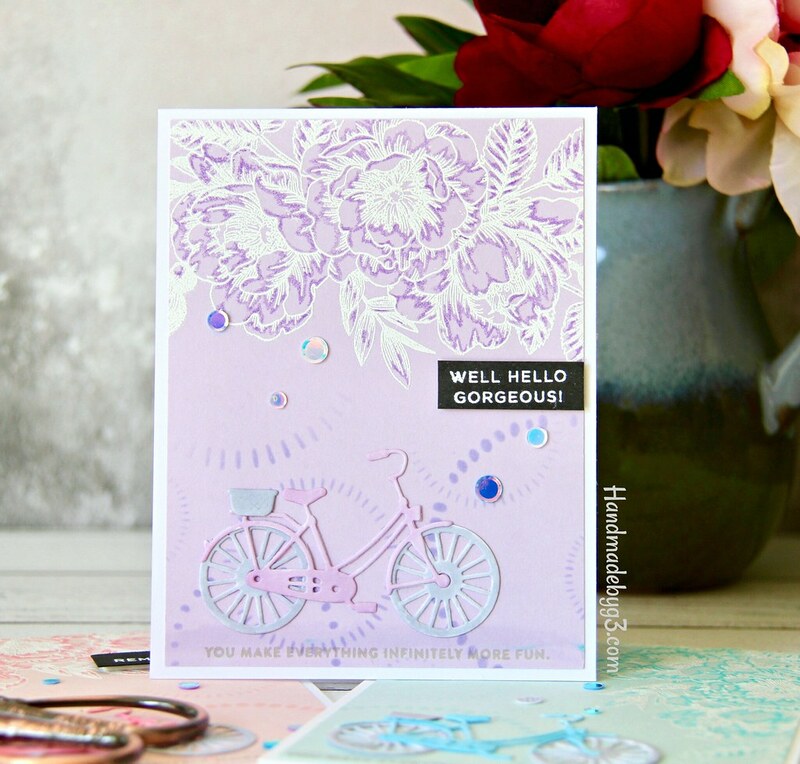 Thanks for writing such a Great Article on Pastel Monochromatic Card set! We offers P2P Online money lending in India. We offer Peer to Peer Loan by connecting Borrower and lender.